For over 65 years, JBL has employed the best methodology and tools, and, as established at the very beginning by their founder, James B. Lansing, developed everything from the ground up. This not only ensures success in the marketplace, it guarantees JBL’s efforts exceed the needs and expectations of audio professionals throughout the world. Never straying from this exacting formula, the JBL journey has produced a prolific list of audio achievements, groundbreaking technologies, revolutionary advances in the art and science of professional audio, many patents, and many awards. It’s a journey that is legendary worldwide and has positioned JBL as the world leader in professional audio. Not just as a brand, but as a company known for consistently blending creativity and science as a manifestation of their passion for sound and commitment to those who create it. Purposeful invention is no accident. It requires leadership, persistence and an unfaltering commitment to JBL’s ultimate design goal: create the best tools for better, more accurate sound. 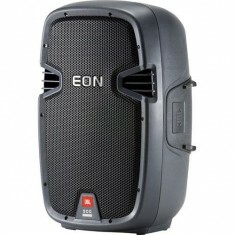 JBL’s EON-510 PA Speaker, a 280 watt high-performance powered PA speaker system, is available for purchase or hire at Mic Hire. Mic Hire © 2019. All Rights Reserved.